Smartsheet: Stop Alerting me! The task is complete! UPDATE 2017-03-23: Smartsheet release yesterday (2017-03-22) may have made this work-around moo. I hope so, but won’t know for sure until I have updated a bunch of sheets. If you find something that still requires this work-around, let me know. 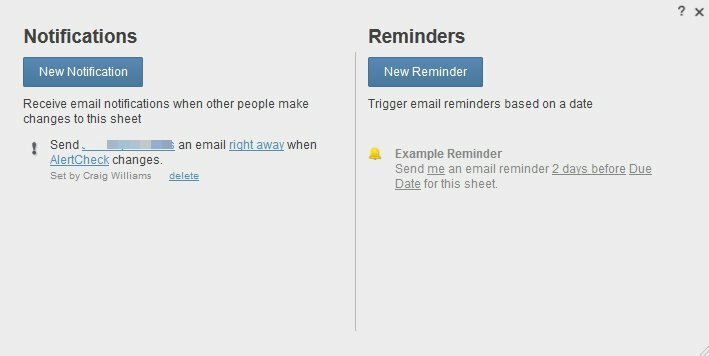 Smartsheet has two types of Alerts: Notifications and Reminders. A common request is how to turn them off when their usefulness has passed, for example when action has been taken to complete a task. Notifications are triggered on changes to cells (one or more) in a row. Assuming someone or something (a formula for example) is still updating the row, causing a triggered Notification and you want this notification to stop for that specific row, here’s how to do it. Create a new column – I called mine [AlertCheck]. It should be a Text/Number type column. Both of these examples use row 23 for illustration purposes. If the completed marker does not indicate the task/row is complete, then the formula will show the date and time from the Modified column. This is a System column that updates when any cell’s on the row contents change. The (+ “”) is a trick to return both date and time instead of just the date from the System column. Set up an Alert | Notification to trigger on changes to the new column ([AlertCheck]). When the row is marked complete, the [AlertCheck] column will be blank and one more (the last) triggered Notification will be sent. Note that both examples are shown here, but the formulas are not set up to check either criteria (though that is an easy change). I hope this helps add a bit to your Smartsheet environment. If you have questions about this, just let me know in the comments.